I don’t know. I mean what can I say, our whole world came tumbling down from above, sounding like a giant reverberating slinky while it coiled itself on the side deck. We hardly had time to blow the jib clutch and turn Escape Velocity into the wind in a vain attempt to save the rig but it wasn’t to be. It took eight seconds for the rig to hang upside down pointing towards the bottom of the Pacific Ocean. With a tearful, but rueful smile to each other we cut the last line and watched 22 years of hard work and dreams slide under the surface of the Pacific Ocean 2,500 nm shy of the Marquesas. Like our good friend Mark says it’s a sod and a bugger but there it is. It was time to save ourselves. In aviation circles they have a wonderful truism that goes something like you never want to run out of altitude, fuel, or ideas all at the same time. We had no sails but we still had fuel and barring anything unusual we should make it back, some 440 nm, to Academy Bay, Galapagos. As usual, the unusual happened quickly. The current and winds which we were riding to the Marquesas were now right on our nose, cutting our single engine cruising speed down to 3 plus knots and our motoring range by more than half. Not good, not good at all. It would be a close thing escapees, a very close thing. After four days we tucked in close to Isabela’s shoreline and were the beneficiaries of a one and a half knot reduction in counter current. 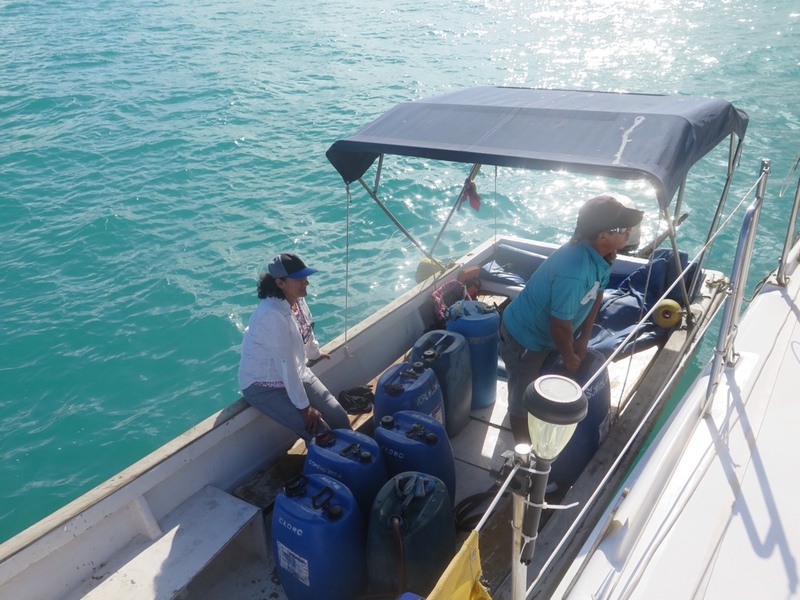 We rounded Puerto Villamil and with roughly ten gallons of diesel left we diverted into Isabela to the well wishes from old friends and some new ones too. Word gets around fast. After a few days of high level negotiations, the authorities reluctantly gave up thirty gallons of diesel so we could get out of their hair and into someone else’s. However the kindness of the fellow cruising community continues to amaze me, and with Dirk from Dancing Bear hitching a ride and occupying the spare stateroom, we headed out of the harbor towards Santa Cruz. Once again, It didn’t take long before the unusual overtook us as our engines started to stumble. Bad fuel @$5.00 per US gal. Switching back and forth I changed filters on each engine and we thought that we could safely continue. Ok this qualifies as a bad start, but the further we traveled the less current we noticed and we arrived at Academy Bay earlier than we expected. Phase two of our slow motion rescue is complete, now it’s on to more petty bureaucrats with nonsensical rules, seemly made up just to make this situation more difficult, plus a few repairs, and inventing a way to store lots of diesel aboard. Maybe we can even get the ball rolling on re-rigging. Like the flightless cormorants that live here, Escape Velocity has no wings so we’ll just have to evolve, or as Randy Newman says, you gotta roll with the punches. We’ve made the transition — temporarily — to motorboat. Sailors call them stinkpotters but we don’t mind, at least for the time being. As a catamaran with two engines and pretty generous fuel capacity, we have a longer range than most monohulls of our size. In our situation, that’s a good thing. 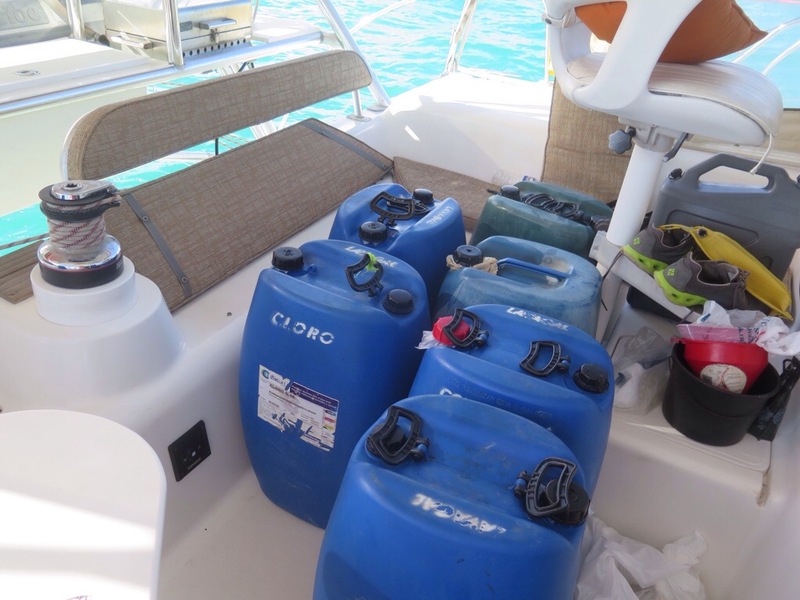 We took delivery of 250 gallons of fuel on Tuesday and added to whatever we already had on board (who ever trusts their fuel gauge?) we’re confident we can make Costa Rica safely. Yes, Costa Rica. That will be our next destination. Our options were limited but with great input from various quarters we think this is our best bet. No solution is without its challenges and Costa Rica has them too, but the biggest vote in its favor is that we’ve never been there and for us virgin territory trumps familiar every time. The cruisers still here in The Galapagos at this late date are all in the same predicament. All have experienced gear failure of one kind or another, all are waiting for replacement parts to arrive, all are doing the daily permission dance with the agents and port captain. At the Internet cafe ashore they share news of tech support calls and shipment tracking, make trips to local machinists or chandleries, and wait out a longer stay than expected in a place that starts out enchanting and ends up feeling like a trap. The boats heading across the Pacific to the Marquesas and beyond, all of them but us, are starting to worry about timing. The Pacific is huge and it’s a long way to go before the beginning of cyclone season when you have to get safely out of the cyclone belt for the southern summer. This constant readjusting of departure date and cruising schedule is wearying and stressful. In a way, we’re a little less stressed because our choices are more limited, and we have a solid priority: get rerigged. Everything we do is to get us closer to that goal. We’re more or less ready. Today we provision, make some reheatable meals, and watch the weather.